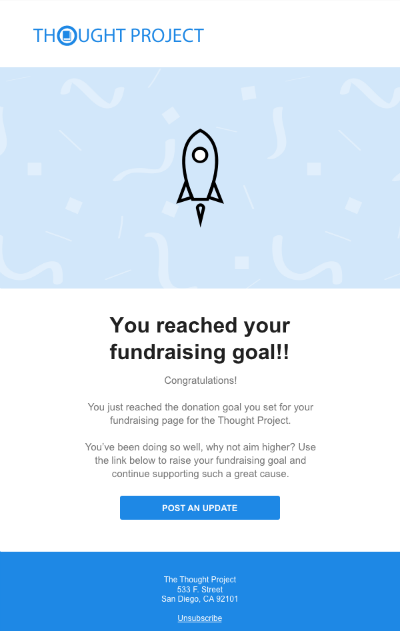 Emails that motivate and activate fundraisers are one of the most important tools for running a peer-to-peer campaign, but they can also be one of the hardest and most time-consuming tasks. To encourage and empower fundraisers, you need to draft smart emails for carefully segmented fundraiser lists throughout the campaign. Even DIY campaigns—like birthday fundraisers—can benefit from an email series that delivers helpful tips and encouraging messages. To help you manage a scalable system for peer-to-peer fundraising emails, we’ve whipped up a list of best practices to follow as you craft each message. Use these nine quick email tips to guarantee you’re sending fundraisers a meaningful, beneficial message at every touch point. This is a tip you might already know, but it’s worth repeating. Every email to fundraisers should be distinctly branded, which means it should include your organization’s logo or that of the campaign they are participating in. With the amount of email we get today, this makes yours easy to recognize. When your emails all look, feel, and sound the same, readers can better digest the content because they know what to expect. A consistent voice and tone across your marketing materials strengthen your brand, while consistent design can build recognition. With the new Classy Peer-to-Peer Fundraising, you can prepare an entire email series at once to make sure the tone and look stay the same. Personalization isn’t always about simply adding the recipient’s name to your emails, although that’s easy to set up through your email automation software now. There are lots of ways to personalize a message, especially to fundraisers. Individual fundraisers participate in specific campaigns, on teams, for distinct fundraising goals, or particular programs they care about. When you’re creating emails to encourage peer-to-peer fundraisers, use these details to give your supporters a tailored message. On Classy, you can also ask Custom Questions during a fundraiser’s registration process to understand more about them and better personalize their experience with your organization. Add any other timely touchpoint that are relevant to your campaign! We’ve created an entire guide to help your fundraisers crush their goals, but you can also try breaking out the information into digestible pieces. This is especially important for first-time fundraisers. Whether you’re emailing first time fundraisers or team leaders, your peer-to-peer emails should each bring value to the table. Whether that’s basic fundraising tips, stats to share about your organization’s impact, or well-designed assets that spice up social media asks, every email should make it easy for fundraisers to take action and succeed. Because manually sending emails is incredibly time-consuming, use milestone emails to save tons of valuable time during the campaign. 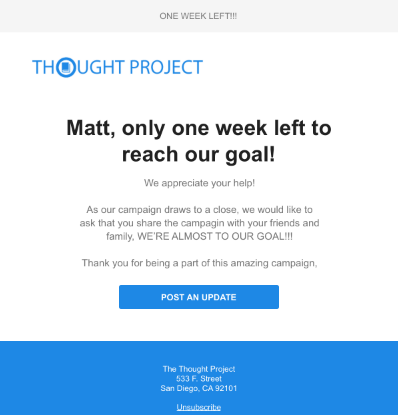 Milestone emails are triggered when a peer-to-peer fundraiser hits a certain percentage of their goal. 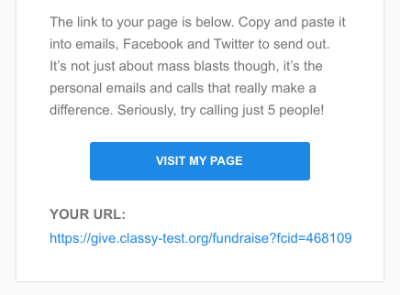 For example, you could create an email that is automatically sent when someone has reached 50 percent of their fundraising goal. This shows fundraisers you are paying attention to their progress and it encourages them to keep going. Understanding the performance of fundraiser communication is critical so that you can improve it in the future. At the very least, track opens and clicks and start testing how you might improve your metrics. To increase click rates, you might try a more compelling call-to-action. To increase open rates, you might try different subject lines and see how they perform in your reports. Peer-to-peer fundraisers dedicate a significant amount of time and effort for your organization. Make them feel a part of it. 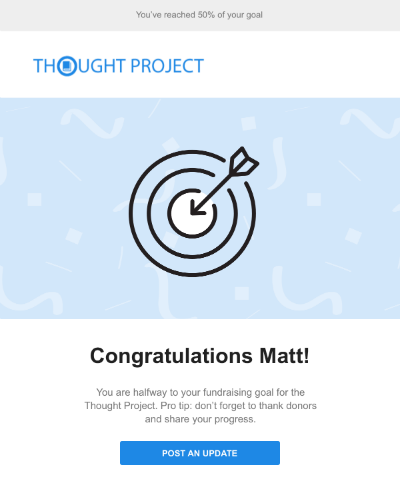 At the very least, every single email you send to fundraisers should highlight their connection to your cause and moving the needle for your organization. Not only will they as feel special as they are, but they’ll also be motivated to keep going, spread the word, and come back time and again. Peer-to-peer fundraising has huge potential for nonprofit organizations, especially those willing to encourage and support their fundraisers. Use these tips to motivate your fundraisers and give them the know-how to raise more money for your mission.